An upcoming exhibit that honors retiring art professor Laurie Peters applauds her 45 years at the University of Vermont. Actually, Peters insists it was “only” 41 years, though “before that I taught in elementary and high schools around the Burlington area,” she says. Either way, four decades and change is a long time to be influencing students. And that she did. In fact, it could be argued that the results of Peters’ tutelage are more tangible than those many other teachers could claim. Consider the successful jewelers and sculptors in the area whose names you probably know: Timothy Grannis, Jane Koplewitz, Jacob Albee, Kate Pond, Chris Curtis, just to name a few. At least a couple — Donald Friedlich and Etienne Perret — have gone on to international careers. All were Peters’ students. Peters’ courses in fine metals and “jewelry perspectives” at UVM gave each of these artists a solid foundation in the skills, tools and design possibilities of their craft. 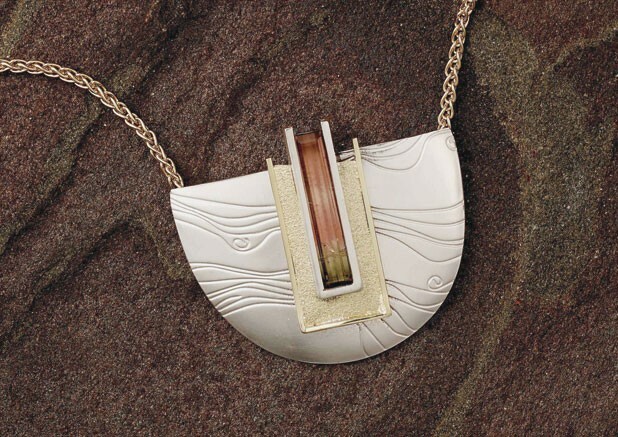 In a show that opens next Thursday, December 5, at Von Bargen’s in downtown Burlington, some 15 jewelry designers will convene to show their work alongside that of Peters herself. Peters, now 68, is a New Jersey native who lives in Warren and says she “prefers rural.” She’s not keen on talking about herself, but friends reveal that she has long been as passionate about playing polo, kayaking and traveling as about teaching and making jewelry. Peters readily waxes enthusiastic about the last, however, noting that metalworking is “addictive.” Her strategy in the classroom was simple: “If I can get someone who’s basically interested, I can get them hooked,” she vows. That’s probably just what the jewelry in the Von Bargen’s exhibit will do — including generating discussion among the designers themselves. Their work will illustrate the makers’ grounding in solid technique as well as their individual, unfettered visions. Peters can take some credit — though she probably won’t — for both. To a person, those interviewed for this article acknowledged her for being tough — “She does not allow students to take shortcuts,” says McIntyre — and for nudging them toward their own artistic expression. Grannis, who graduated from UVM in 1976, remembers that Peters had students tackle big metal sculpture first as a way of working out visual and technical problems. “When your thinking is expanded, you’re opened up and [you] apply your opened mind to making tiny sculpture — jewelry,” he says, noting that jewelry design is more constrained. “It has to fit a body, be comfortable and wearable,” Grannis says. This kind of mind-expanding strategy was a hallmark of Peters’ teaching, he adds. Yet, despite Peters’ own strong aesthetic, she didn’t “push it on anybody,” Albee says. “I see lots of people now who say, ‘I studied with so and so,’ and you can see that influence. That’s not a bad thing, but Laurie could help students find their own aesthetic. That advice worked for Albee, 37, whose striking designs and eye for unorthodox materials — including meteorite — have led to a successful career. But other Peters students “are not doing it commercially,” she says. They just love making jewelry. One of them is Lynne Bond. It’s a shame, then, that no more students at UVM will have the opportunity to share in this passion for artistic expression — or a career — in fine metals. With Peters’ retirement, the department is discontinuing the program, and that has put some of her former students in a state of mourning. Exhibit featuring Laurie Peters and 15 other jewelry designers, December 5 to 18 at Von Bargen’s in Burlington. Reception, December 11, 5 to 8 p.m.